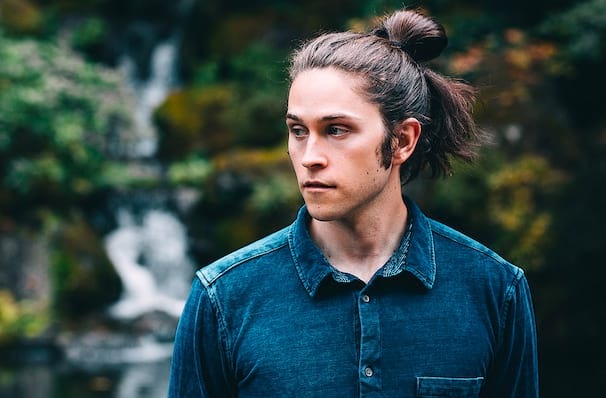 Purveyor of lushly atmospheric tracks with distinctive, pulsating grooves, Jackson Stell AKA Big Wild took up his moniker when he moved from his native Lancaster, Massachusetts to California in his 20s. Taken with its picturesque landscapes and natural beauty, the electronic DJ, producer, composer, and engineer was inspired to be adventurous with his sound, fusing hip hop-tinged, bass-heavy beats with summery synth lines and upbeat rhythms. 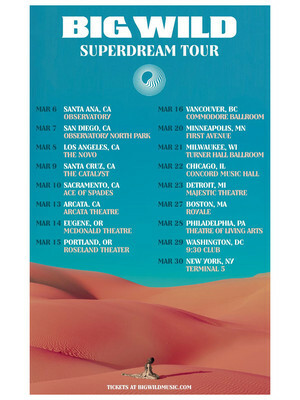 The young rising star hits the road with Canadian DJ Robotaki and Australian producer Mild Minds this Spring to celebrate the release of his debut album 'Superdream'. The hotly anticipated release comes after a whirlwind few years of collaborations and touring with the likes of Tove Styrke, Pretty Lights, Tycho, Griz, Bassnectar and Odesza, the last of which were instrumental in launching Big Wild's career after they heard his mixes on Soundcloud. The album's two lead singles 'Joypunks' and 'Maker' heralds a return to Big Wild's trademark cinematic electronica, with an added retro 80s feel and joyful, singable vocal melodies recorded by the man himself. Wear comfortable shoes, because it's going to be impossible not to dance at a Big Wild concert. Seen Big Wild? Loved it? Hated it? Sound good to you? Share this page on social media and let your friends know about Big Wild at Galaxy Theater. Please note: The term Galaxy Theater and/or Big Wild as well as all associated graphics, logos, and/or other trademarks, tradenames or copyrights are the property of the Galaxy Theater and/or Big Wild and are used herein for factual descriptive purposes only. We are in no way associated with or authorized by the Galaxy Theater and/or Big Wild and neither that entity nor any of its affiliates have licensed or endorsed us to sell tickets, goods and or services in conjunction with their events.